We’re looking for the most cost effective/high performance solution to provide wireless internet to a yacht when moored in a harbour, tapping off neighbouring Wi-Fi Hotspots that may be provided. 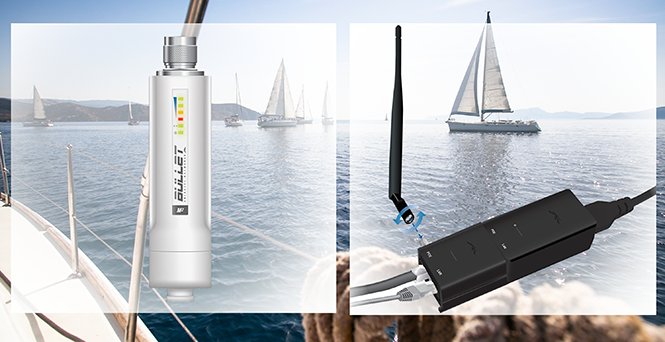 This is a cheap and cost effective way to bring Wi-Fi to your boat or yacht. This blog post focuses on the configuration of the devices, but not the physical installation. Today we’re going to be using an Ubiquiti Bullet M2 HP with the Ubiquiti airGateway LR. We'll also use a generic 2.4ghz Omni Antenna for the Bullet & the Ubiquiti airGateway POE-24 power supply that clicks together nicely with the airGateway. The default user name and password is ubnt & ubnt, and we'll change this later for security purposes. I also select the country code as United States as most devices can only see the channels that the United States country code allows. You may run into issues if this is set to another country. The Quick Setup Wizard appears! Lets follow it. Ignore the airMAX CPE detection and put in a password of your choosing & hit Next. Enter a SSID (network name) and a password for it (between 8 and 64 characters long) and hit Next. The next screen will ask you to verify your details that you've entered in, and click finish. Set a static address on your laptop or device to 192.168.1.10 with a subnet of 255.255.255.0, and go to 192.168.1.20 in your web browser. Apply the changes on the page, and then remove the static IP off your laptop or device. You can now plug the airGateway into the power injector for the Bullet M2. Both devices should have power and you should see a new wireless network broadcasting from the name that you chose. Congratulations! That's all you need to do to set it up! In your web browser, go to your default gateway (http://192.168.99.1) (which is the Rocket M2) in your web browser. Enter in your username and password and login. Once logged in, head to the Wireless tab and next to the SSID box, you’ll see a button that says Select…, click this. Your device will now do a scan of neighboring wireless networks. Once the scan is complete, the Signal/Noise column, the first number (-66 / -89) needs to be below 80 for the network to connect successfully. Also take note of the Encryption Column, if it says NONE, no further action is required, if it says WPA or WPA2, you’ll need to know the password to be able to join this network. Click on the radio box to the left of the network you want to connect to, and click Lock to AP at the bottom of the page. Back on the wireless page, select Change, then once the page refreshes, click apply.